From an engineering perspective, the nuclear decommissioning industry presents some of the most challenging conditions imaginable. It’s a hostile environment, dealing with some of the most toxic substances known to man. The threats are of catastrophic proportion and there is no room for error. Against that challenging backdrop, we have a track record of producing inventive solutions that can be quickly deployed with striking effect. Our Bladecutter device was originally developed as a horizontal dredge system for the Hunterston A nuclear facility. Its patented design allows it to cut through and collect stratified nuclear sludge, fluidising the material as part of the process. This allows the highly dangerous contaminated material to be collected from radioactive sludge ponds and gathered for more effective storage – usually box encapsulation. To date, two versions of the Bladecutter device have been deployed at Hunterston, allowing the efficient clean-up of two of the site’s nuclear bays. Following the success of the Bladecutter horizontal dredge, the Barrnon team developed a vertical version to remove radioactive sludge from underwater skips at decommissioning sites. It is now part of extensive trials to establish the efficiency of the units which are currently under consideration for use in the ponds at Sellafield and at Fukushima in Japan. Our Rotocutter device has been developed to break down and recover hard heel and bitumen encased radioactive waste. This type of waste exists in areas where water cannot be used because of the risk of leaching into the watercourse. It’s a particularly challenging environment and no other recovery system has been deployed effectively to date. Rotocutter, however, with its extremely tough and hard wearing blades is able to break down the contaminated dry material and recover it efficiently. The tool is now being put through a range of tests and is under consideration for deployment at the Hanford site in the USA. The Hydrospyder is a floating deployment tool. Inspired by the insect the water boatman, which uses surface tension to walk on water, our Hydrospyder can float to any point and deploy a wide range of different tools. Available in different sizes, our initial design lifts up to 18 tonnes under water and, like all our tools, can be operated with precision from a remote location. Hydrospyder is a remarkably useful device. Its buoyancy can be varied and, using its hydraulic legs, it can alter its size to manoeuvre into restrictive areas. Using on-board cameras, it provides the operator with a clear view of the environment and the work being undertaken. 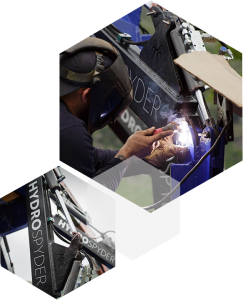 Each Hydrospyder is custom built to the exact client specification and is scaleable depending on the precise requirements of the work being undertaken. UmbiM is an innovative, automated umbilical management system currently at the concept stage. It will be developed and tested by Barrnon in the near future and has been designed to work alongside our range of tools which require remote deployment in extremely toxic situations. 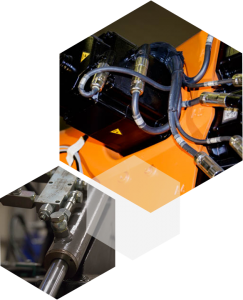 Once developed, it will allow for the remote release and recovery of the umbilical control cables that work with devices such as the Hydrospyder, Bladecutter and Rotocutter. UmbiM extends the reach of these devices and improves the management of the umbilical cabling. Barrnon’s nuclear decommissioning tools can be combined and customised to suit specific client requirements. In our experience, each challenge in the nuclear decommissioning industry is unique. And each needs a bespoke solution. That’s why each piece of equipment we design is built to order and why we also devise complete ‘turnkey’ solutions working with third parties and trusted suppliers to match the exact specification of the job in hand.